The Oneworld Los Angeles lounge can be found in Tom Bradley International Terminal on level 5. Once you exit security, head to the right and find the escalators that will take you up one level. As it’s name implies the lounge is for business and first class passengers travelling on Oneworld airlines. Passengers who are Oneworld Sapphire or Emerald can also enter, as well as Qantas Club members provided their next onward flight that day is a Qantas or Jetstar+ flight. The 600 seat lounge is separated into several distinct zones including a fire place, bar, dining areas, showers and work stations. Seating is spaced out to ensure guests do not feel crowded during peak hours. Chic, modern decor and soft lighting created a relaxing atmosphere to the lounge. As my flight from Sydney landed at 6:00 am, breakfast items were on offer in the lounge’s self serve dining area which was comprised of a mix of hot and cold items such as pastries, cereal, scrambled eggs, a pancake machine and fruit. Drinks were also self service and included fruit juice, soft drinks, coffee machine, Dilmah tea, and even sparkling water on tap. Barista made coffee could be ordered from the bar located to the right of the entrance. Behind the entrance, there’s a work station consisting of 6 computers, printers and newspapers. Speedy Wi-Fi could be found throughout the lounge, as well as numerous power points and USB ports allowing travelers to be charged and connected. With 16 well equipped showers, the Oneworld Los Angeles lounge makes it convenient and easy for passengers to fresh up during a layover. An attendant is stationed at the front of the showers to help allocate showers to guests and provide amenities like toothbrushes and shower caps. Each shower room had a rainfall/hand held shower, toilet, wooden bench, hair dryer and clothes hooks. Bathroom amenities were from Australian brand ASPAR, which is the same brand found in Qantas lounges around the world, and came in large pump bottles. 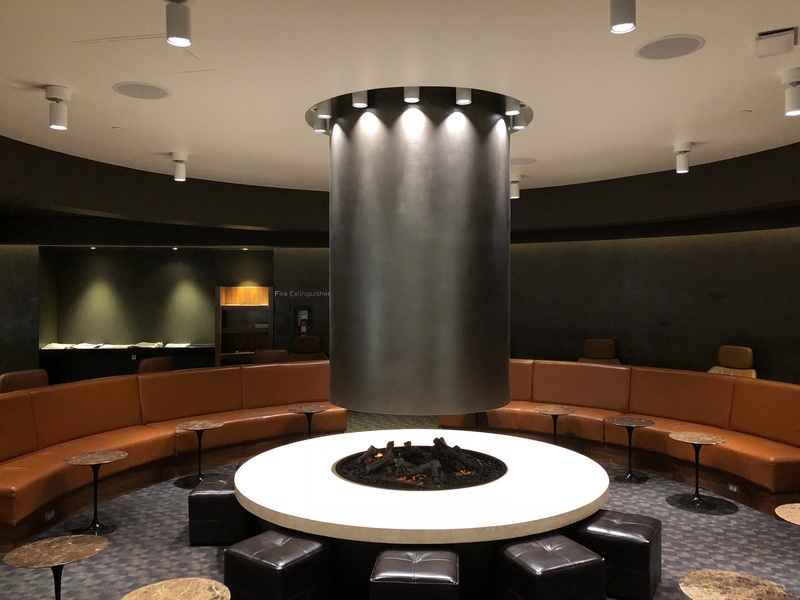 For passengers transiting at LAX , the Oneworld lounge is a reprieve from the chaos outside thanks to the large open spaces, decent selection of food and plentiful showers.